One of the most common parts of speech used in everyday conversation and writing, whether formal or informal, is the pronoun. In this article, the most common type of pronoun will be discussed—the personal pronoun. Personal pronouns can be simply defined as the type of pronouns used to replace a specific noun in a sentence. It can be used to take the place of a person, an animal, a thing, or a place, in order to avoid stating the same noun over and over again in the same text. In a sentence, a personal pronoun can be used in place of a noun that is mentioned earlier in that sentence. You should also know that personal pronouns can have two functions—they can act as either the subject or the object in the sentence. With this, it can be further categorized into two kinds: the subjective personal pronoun (used as the subject) and the objective personal pronoun (used as the direct object, indirect object, or object of the preposition). 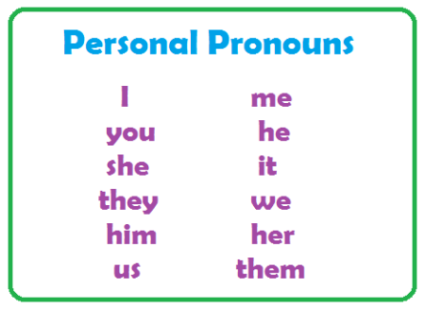 In order to use personal pronouns effectively and avoid confusion, you must make sure that the personal pronoun that you will use agrees in number (singular: I, you, me, she, he, it, him, her; plural: you, they, we, them, us), gender (feminine, masculine, neuter), and person (first person, second person, third person). The underlined words in the sample sentences below show how personal pronouns are used. He bought a new gaming laptop. Can you take him to the hospital? Honestly, I think he won’t make it. They are the worst groupmates I ever had! She pushed the little kid down the stairs. We are going to the coffee shop. Do you want to come with us? Michael and I got it from the novelty shop. All of the sentences from famous literary works provided below contain examples of personal pronouns (underlined words). The main function of the personal pronoun is to take the place of a noun in a sentence. It can be used as a subject or an object (direct, indirect, object of the preposition) in a text/speech, and can serve as a good way to help you avoid repetition of specific nouns. Thus, it can be considered as a tool that can help ease the flow of words and sentences in your speech or writing.